NORTHERN Ireland’s Secretary of State James Brokenshire has pledged to end the secrecy over political donations here, but the Government’s main electoral watchdog has signalled the reforms may not go far enough. The identity of political donors is not currently published in Northern Ireland for security reasons but Secretary of State James Brokenshire is due to bring forward legislation which will permit the publication of donations of over £7,500. If donations fall below the £7,500 threshold for Northern Ireland’s parties the identity of donors would remain secret. A UK government spokesperson said there were no plans to change the £7,500 threshold at present but said the government "would be happy to consider any recommendations from the Electoral Commission and/or political parties on this issue." This comes as The Detail can reveal that almost £1million more was spent at the last two Northern Ireland Assembly elections than was previously reported. The Electoral Commission routinely publishes information on how much political parties spend during election campaigns, but these figures do not include money given by the parties to their individual candidates. Using the electoral return forms for each MLA elected during the last two assembly elections, we have compiled an extensive picture of campaign expenditure during one of the busiest election periods in recent years. 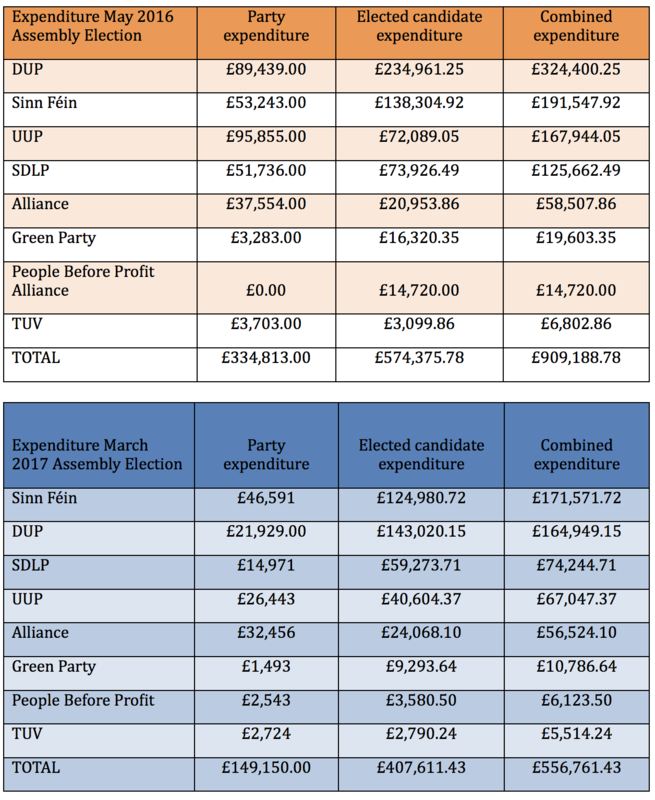 At the beginning of the summer the Electoral Commission published findings that political parties spent a total of £150,080 as part of their March 2017 Northern Ireland Assembly Election campaign. This was widely reported at the time as being a sign of how strained party finances were after a number of consecutive elections. However the new figures compiled by The Detail show that the 90 elected candidates spent a further £407,611 during the same election. Adding these two figures together brings the total expenditure at the March 2017 Assembly Election to over half a million pounds. The combined expenditure for parties and elected candidates at the previous May 2016 assembly election came to £909,188. This means that over £1.4million was spent by political parties and their elected candidates at the last two Northern Ireland Assembly Elections. The figures compiled by The Detail show for the first time the true extent of how much money is being spent during elections here. These figures only include those candidates elected to the Northern Ireland Assembly and do not take into account money spent by candidates who ran for office but failed to get elected. A further £5,000 was also spent by elected independent candidates during both elections. In June this year the DUP was fined £4,000 by the Electoral Commission for delivering an inaccurate party spending return form for the May 2016 assembly election. The return included payments of almost £50,000 which should not have been included, as they were reportable by individual candidates in their own returns. The commission said it was satisfied however that those payments had been properly reported by the candidates and that their inclusion in the party spending return was a duplication. Under current laws the commission has no power to publish or investigate any issues relating to election candidate spending. Speaking to The Detail Ann Watt has called for more powers to investigate expenditure during elections in Northern Ireland. She said: “Information about candidate spending is only available for public inspection by physically going into the electoral office to view the forms. Under current rules it's not that easily accessible and ultimately we believe that information should be put online. “On top of that we as the Electoral Commission have no role in looking at any issues relating to candidate spending, our role only relates to party spending. Information on financial donations to political parties has historically been kept secret in Northern Ireland because of security fears. Though as The Detail previously revealed, a loophole in the law meant that donations to individual candidates during an election have always been accessible in Northern Ireland. Our previous investigations have highlighted widespread inaccuracies in the candidate return forms during several elections in Northern Ireland in recent years, leaving thousands of pounds unaccounted for. The Electoral Commission has confirmed that following our previous coverage on this issue it received a number of queries about potential breaches of the rules relating to candidates’ returns. Since the commission does not currently have jurisdiction over election candidates it has advised complainants to contact the PSNI directly. The PSNI previously said it has not received any complaints or undertaken any investigations into alleged breaches of electoral rules by candidates in Northern Ireland. Northern Ireland Secretary of State James Brokenshire has announced plans to introduce legislation that will lift the ban on naming donors to Northern Ireland political parties. A UK government spokesperson said: "The legislation is currently at an advanced stage of drafting and will be brought before Parliament shortly." However controversially the new legislation will only cover donations made to political parties after 1st July 2017. In 2014 legislation passed at Westminster provided the ground work so that information on donations made to political parties could have been made public from 1st January 2014. A UK government spokesperson told The Detail that "having considered the representations of the parties, the Secretary of State did not believe it right to impose retrospective regulations." Ann Watt welcomed the reforms but called on the Secretary of State to go further. She said: “We've campaigned for many years for information on donors to be put into the public domain because we think it's important that people can see who is funding political parties here. The planned legislative changes will also deliver the reform allowing the Electoral Commission to publish information on donations of over £7,500, bringing Northern Ireland in line with the rest of the UK. However Ann Watt believes the threshold may need to be re-examined: "I think there is an argument that parties in Northern Ireland are much smaller than certainly the major parties in Great Britain so there may be a case to be made for lowering that threshold." It is expected that the Electoral Commission will publish the first set of data relating to Northern Ireland political party donations before the end of 2017.